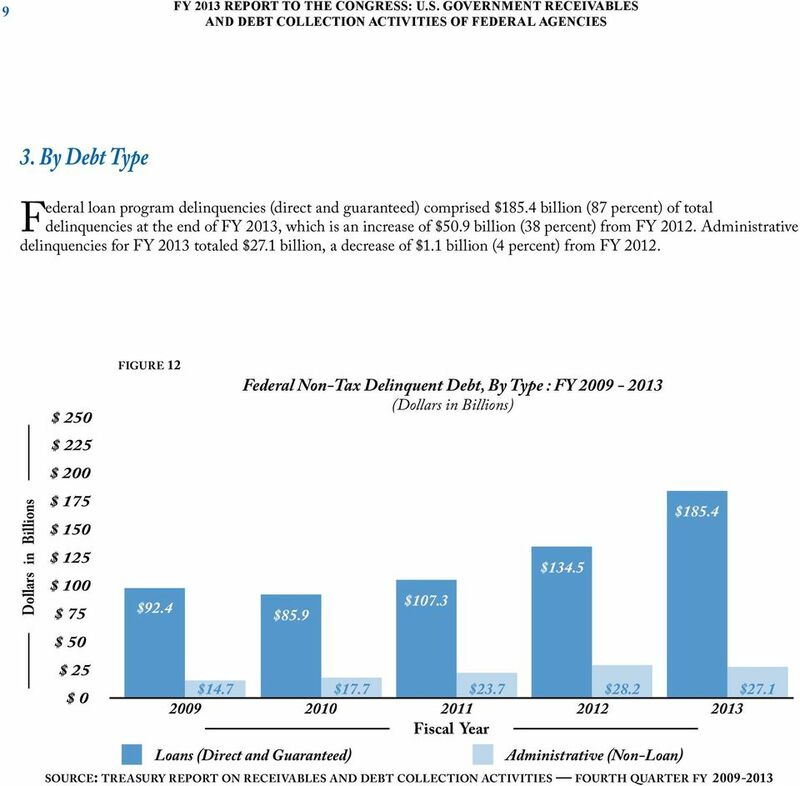 Download "U.S. Government Receivables and Debt Collection Activities of Federal Agencies"
4 1 FY 2013 REPORT TO THE CONGRESS: U.S. GOVERNMENT RECEIVABLES I. Introduction The Secretary of the Treasury (Secretary) reports to Congress annually on the Federal government s non-tax receivables, delinquent debt owed, and debt collection activities. As required by Federal law (31 U.S.C. 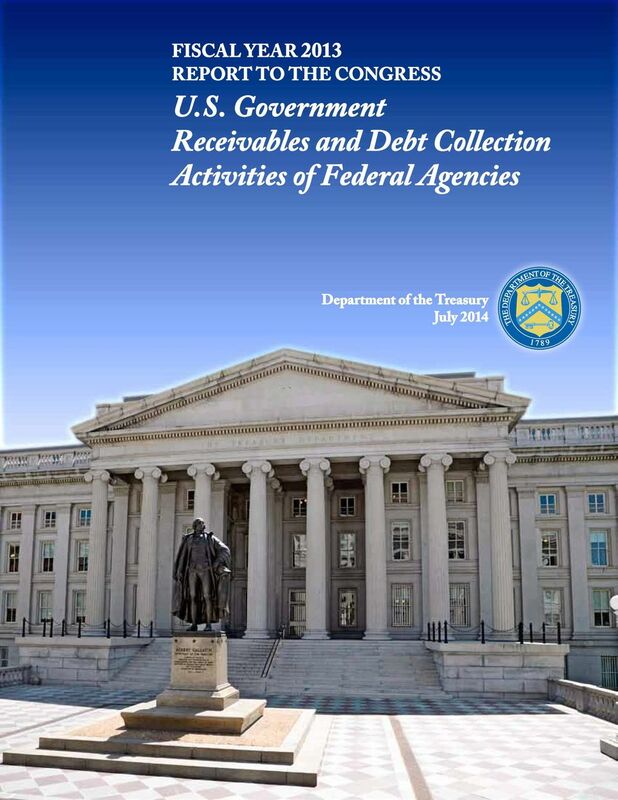 3719), this report includes information that Federal creditor agencies provide to the Secretary on the status of their accounts receivable and delinquent debt, as reported on the Treasury Report on Receivables and Debt Collection Activities (TROR). For more information about the TROR, visit In furtherance of the policies promulgated by Congress and the President, Federal creditor agencies make loans to borrowers, guarantee loans made by private lending institutions, and impose fines and penalties. These activities result in the creation of accounts receivable as assets of the government. In addition, Federal creditor agencies award grants, make payments and provide other services, which, in certain circumstances, can also result in the creation of accounts receivable. 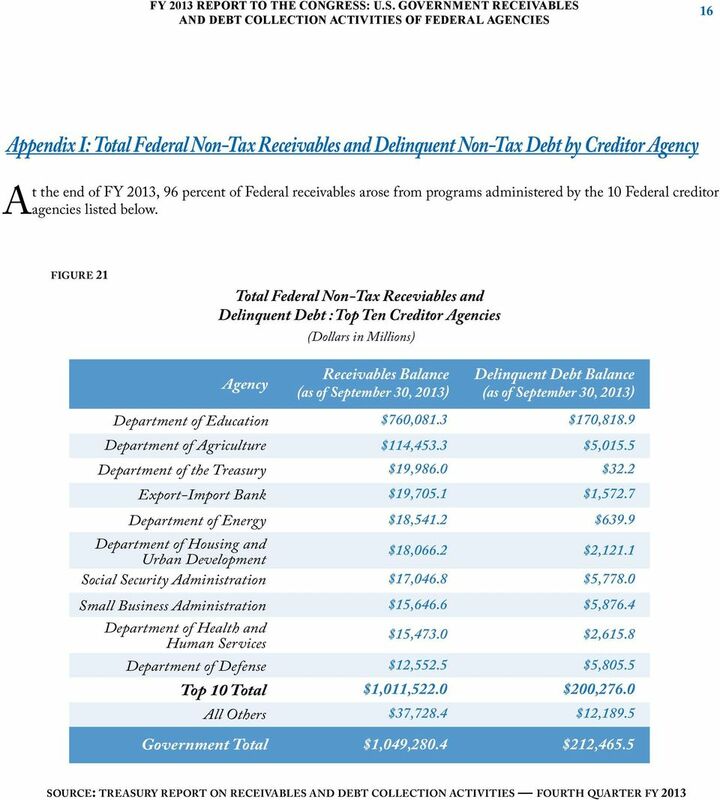 By the end of FY 2013, the government s outstanding non-tax receivables totaled more than $1 trillion, an increase of $118 billion (13 percent) from FY When the government s receivables are not paid by the applicable due date or in the appropriate manner, they become delinquent debt. 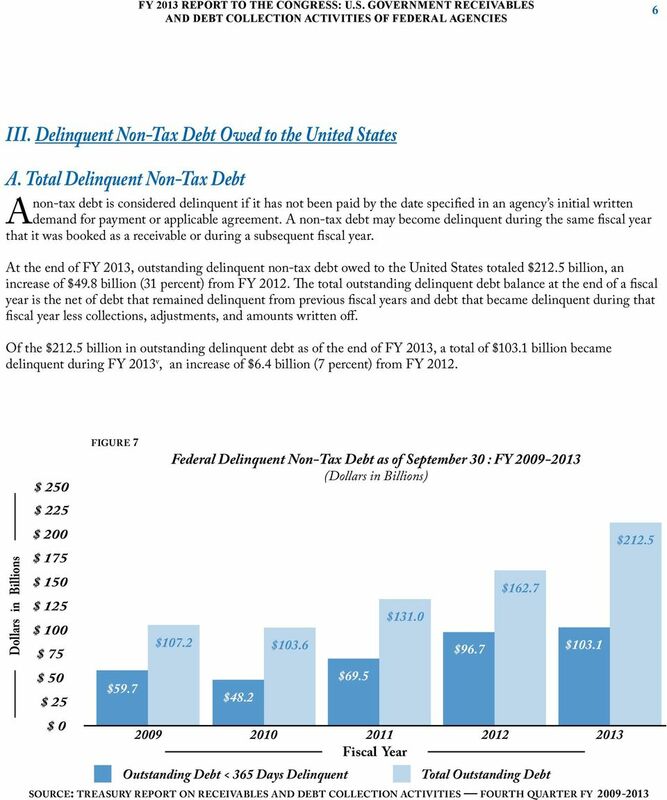 In FY 2013, delinquent non-tax debt owed to the United States totaled $212 billion, an increase of nearly $50 billion (31 percent) from FY Each Federal creditor agency is required to make every reasonable effort to collect its receivables and delinquent debt, using collection tools described in this report. The Treasury and the Department of Justice (DOJ) share responsibility for setting government-wide policy on delinquent non-tax debt collection, and each plays a major role in the centralized collection of delinquent non-tax debt. 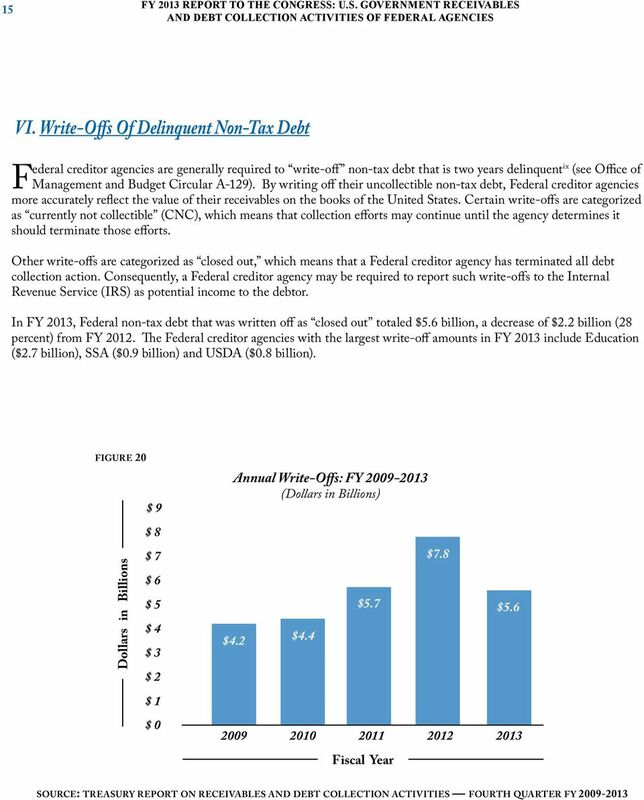 In FY 2013, Federal creditor agencies collected $31 billion of delinquent non-tax debt, an increase of $4 billion (17 percent) from FY This report provides summary data on the value of receivables owed to the Federal government, the portion of those receivables that are delinquent, and efforts to collect or write-off delinquent debt. 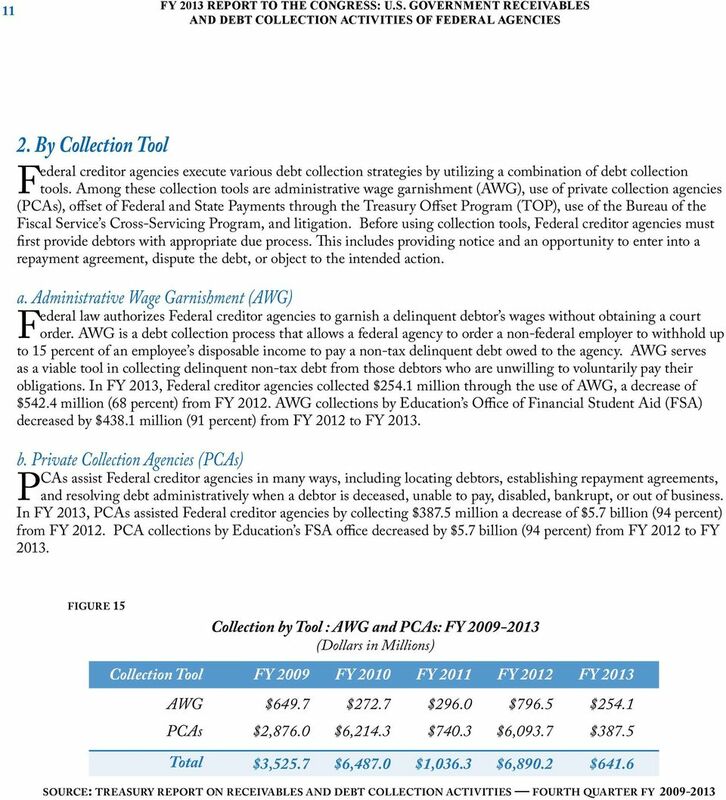 The report provides comparative information from FY 2012 to FY 2013, and focuses on specific aspects of government-wide non-tax receivables and debt collection activities Note: Delinquencies and collections result from various events and conditions that can occur over multiple reporting periods. Therefore, caution must be exercised when comparing annual totals and year-over-year changes of receivables, delinquencies, and collections. Depending on the structure of repayment terms, for example, the date that a receivable is due may be in the same fiscal year that it is booked or it may be in a future fiscal year. 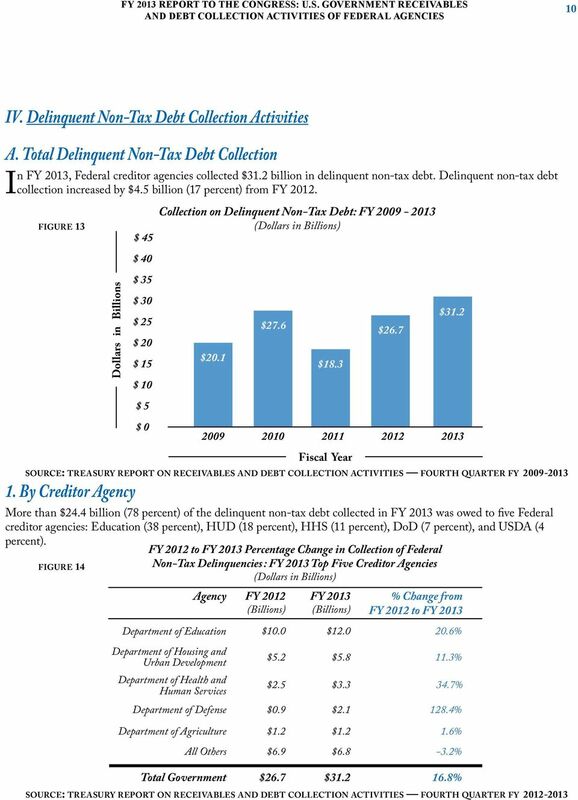 Similarly, collections during FY 2013 may be associated with non-tax debt that became delinquent either in FY 2013 or in a prior year, and are most often associated with receivables that were booked in a prior fiscal year. 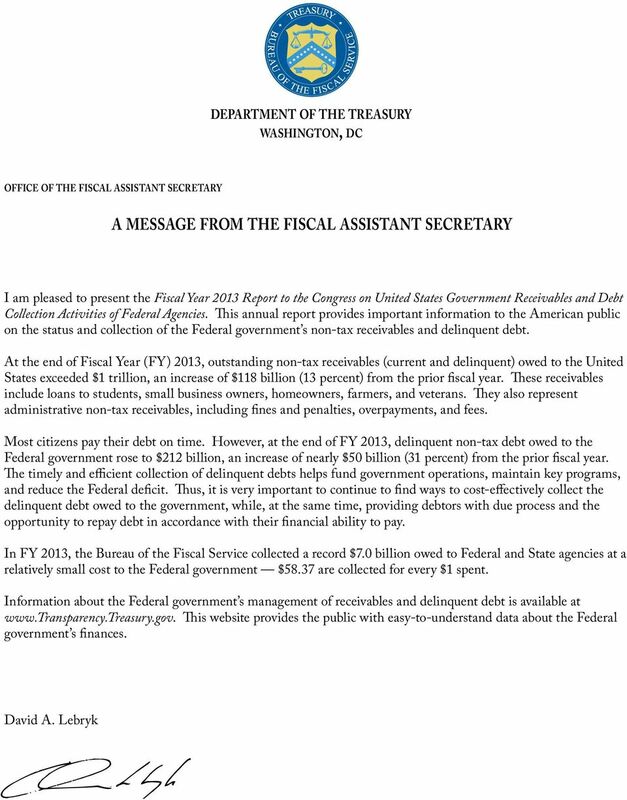 8 5 FY 2013 REPORT TO THE CONGRESS: U.S. GOVERNMENT RECEIVABLES 2. 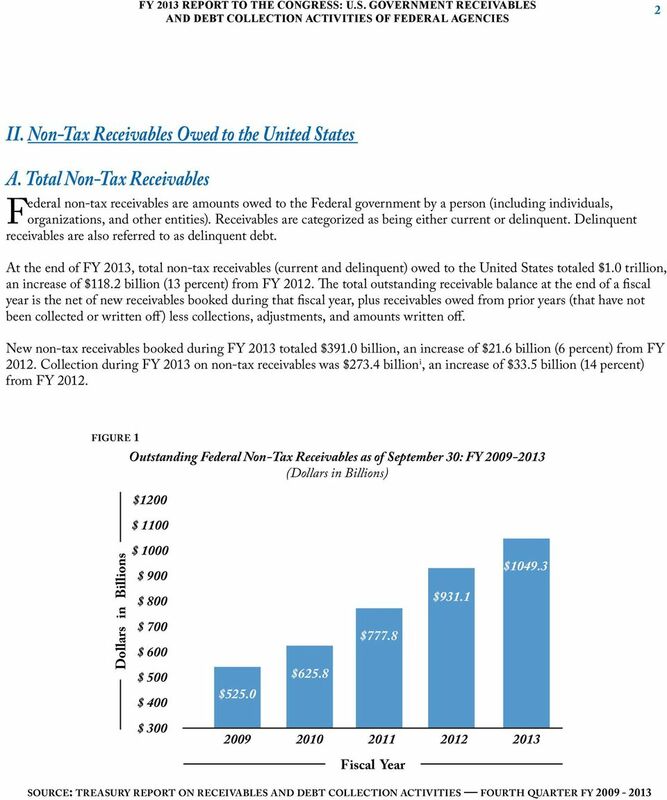 By Receivable Type Of the $1.0 trillion in Federal non-tax receivables outstanding at the end of FY 2013, Federal loan receivables (direct loans and defaulted guaranteed loans) represented $969.3 billion (92 percent) of total outstanding receivables. Direct loans and defaulted guaranteed loans increased by $124.8 billion (15 percent) from FY Administrative receivables (all non-loan receivables iv (both current and delinquent) represented $80.0 billion (8 percent) of the total outstanding receivables by the end of FY 2013, a decrease of $6.6 billion (8 percent) from FY Dollars in Billions $ 1000 $ 900 $ 800 $ 700 $ 600 $ 500 $ 400 $ 300 $ 200 $ 100 $ 0 figure 6 Outstanding Federal Non-Tax Receivables as of September 30, By Type : FY $451.5 $545.9 $693.7 $73.5 $79.8 $84.1 $86.6 $ Fiscal Year Loans (Direct and Guaranteed) $844.5 Administrative (Non-Loan) $969.3 source: treasury report on receivables and debt collection activities fourth quarter fy B. Interest, Penalties, and Administrative Costs Generally, Federal creditor agencies assess interest on outstanding loan receivables. Federal creditor agencies are also generally required to assess interest, penalties, and administrative costs when receivables become delinquent. Of the $1.0 trillion in outstanding current and delinquent receivables at the end of FY 2013, $69.6 billion (7 percent) represented unpaid interest, penalties, and administrative costs. 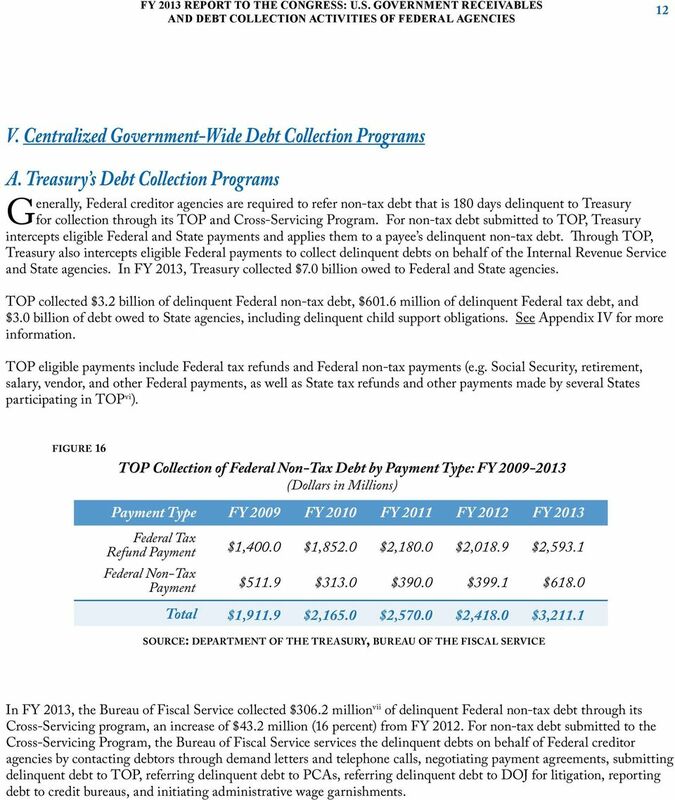 15 FY 2013 REPORT TO THE CONGRESS: U.S. GOVERNMENT RECEIVABLES 12 V. Centralized Government-Wide Debt Collection Programs A. 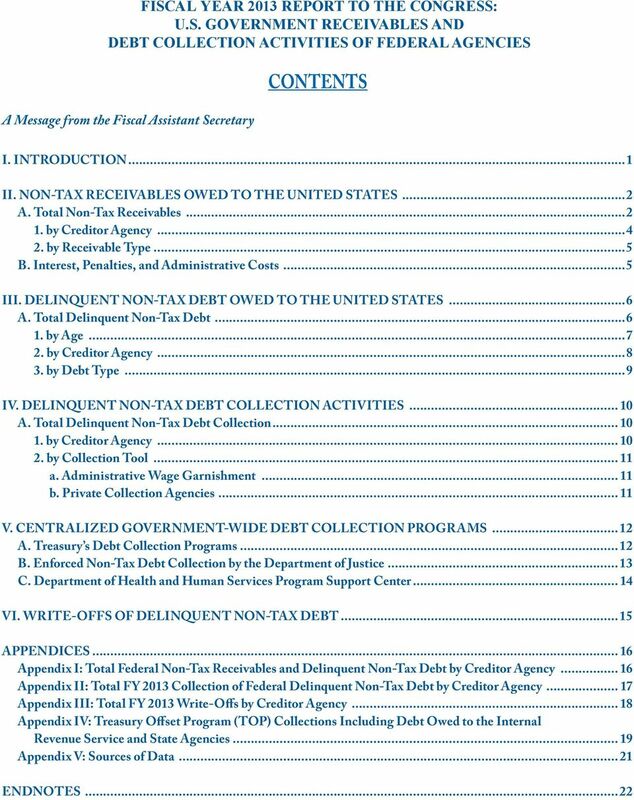 Treasury s Debt Collection Programs Generally, Federal creditor agencies are required to refer non-tax debt that is 180 days delinquent to Treasury for collection through its TOP and Cross-Servicing Program. For non-tax debt submitted to TOP, Treasury intercepts eligible Federal and State payments and applies them to a payee s delinquent non-tax debt. Through TOP, Treasury also intercepts eligible Federal payments to collect delinquent debts on behalf of the Internal Revenue Service and State agencies. 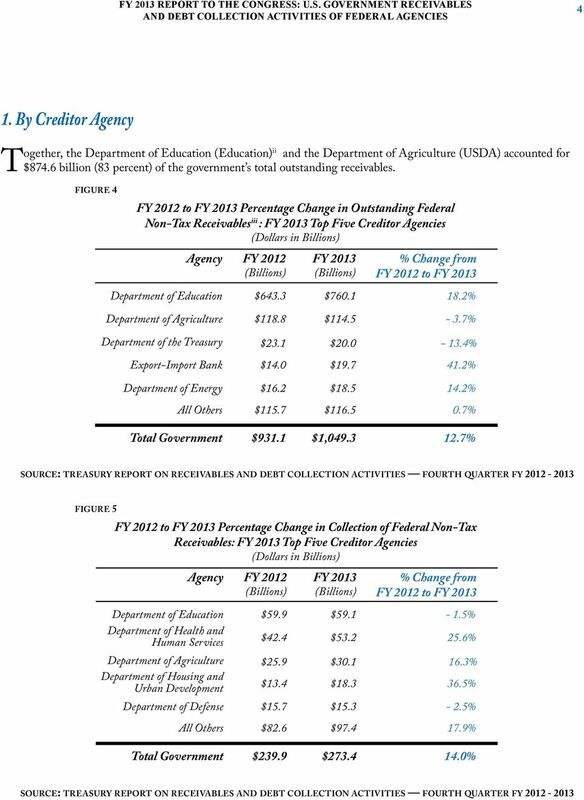 In FY 2013, Treasury collected $7.0 billion owed to Federal and State agencies. 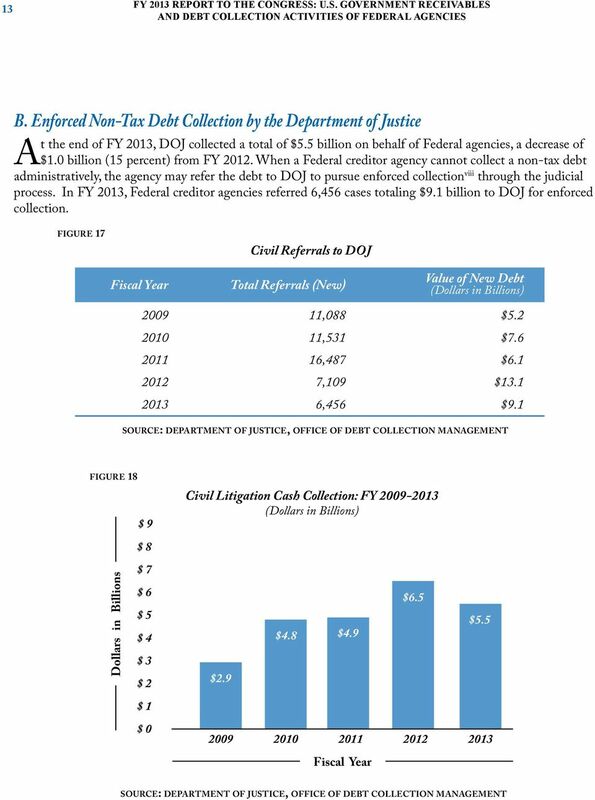 TOP collected $3.2 billion of delinquent Federal non-tax debt, $601.6 million of delinquent Federal tax debt, and $3.0 billion of debt owed to State agencies, including delinquent child support obligations. See Appendix IV for more information. TOP eligible payments include Federal tax refunds and Federal non-tax payments (e.g. Social Security, retirement, salary, vendor, and other Federal payments, as well as State tax refunds and other payments made by several States participating in TOP vi ). 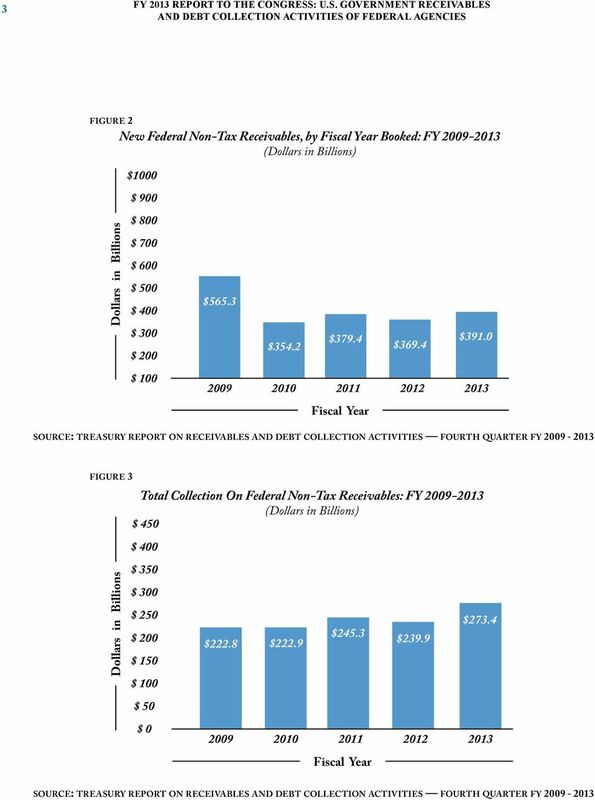 figure 16 TOP Collection of Federal Non-Tax Debt by Payment Type: FY (Dollars in Millions) Payment Type FY 2009 Federal Tax Refund Payment $1,400.0 $1,852.0 $2,180.0 $2,018.9 $2,593.1 Federal Non-Tax Payment $511.9 $313.0 $390.0 $399.1 $618.0 Total $1,911.9 FY 2010 $2,165.0 FY 2011 $2,570.0 FY 2012 $2,418.0 source: department of the treasury, bureau of the fiscal service FY 2013 $3,211.1 In FY 2013, the Bureau of Fiscal Service collected $306.2 million vii of delinquent Federal non-tax debt through its Cross-Servicing program, an increase of $43.2 million (16 percent) from FY For non-tax debt submitted to the Cross-Servicing Program, the Bureau of Fiscal Service services the delinquent debts on behalf of Federal creditor agencies by contacting debtors through demand letters and telephone calls, negotiating payment agreements, submitting delinquent debt to TOP, referring delinquent debt to PCAs, referring delinquent debt to DOJ for litigation, reporting debt to credit bureaus, and initiating administrative wage garnishments. 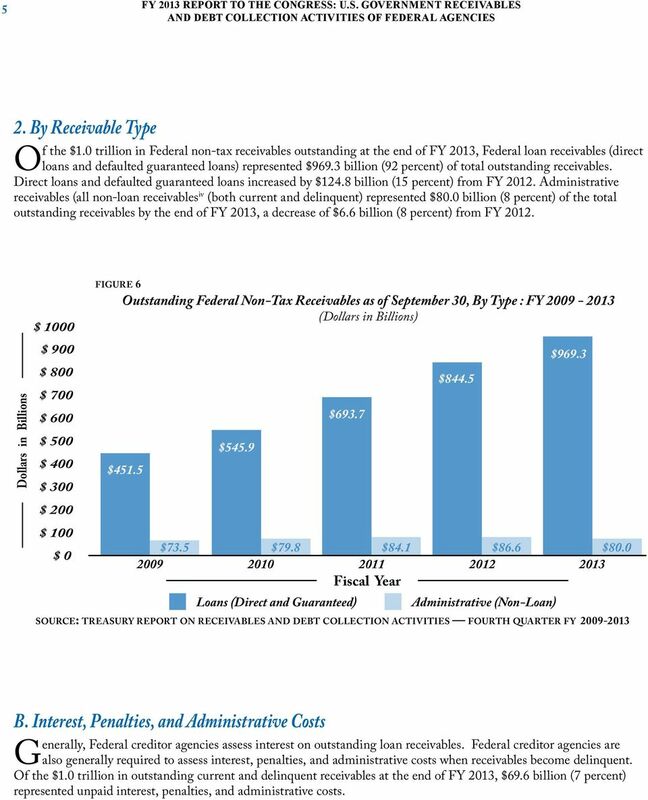 22 19 FY 2013 REPORT TO THE CONGRESS: U.S. GOVERNMENT RECEIVABLES Appendix IV: Treasury Offset Program (TOP) Collections Including Debt Owed to the Internal Revenue Service and State Agencies The Treasury Offset Program (TOP) is the centralized process through which Treasury and other disbursing Federal creditor agencies intercept, or offset, eligible Federal and State payments, including tax refund payments, to a debtor to satisfy the debtor s delinquent Federal non-tax debt and delinquent debt owed to State agencies, including child support and unemployment insurance obligations. In addition, the Federal Payment Levy Program, processed through TOP, allows the Internal Revenue Service (IRS) to continuously levy Federal payments due to delinquent Federal taxpayers. 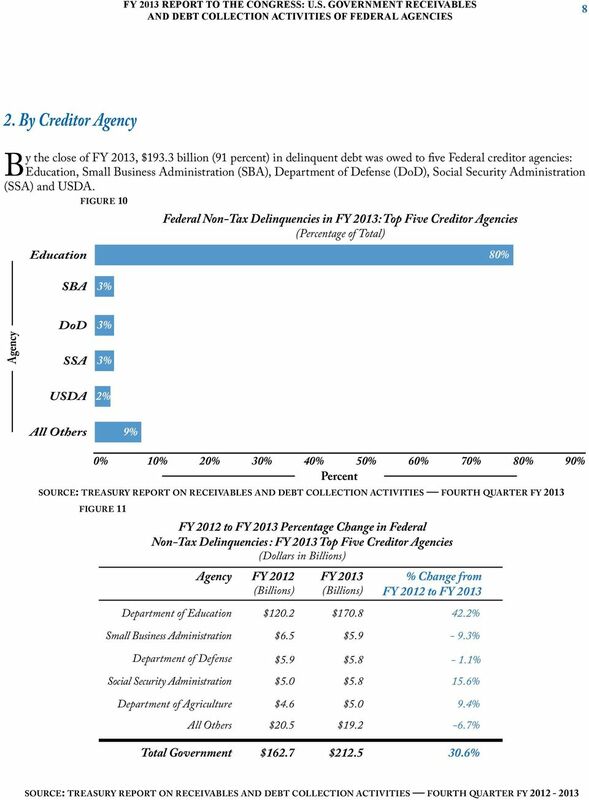 x For FY 2013, $6.8 billion was collected through TOP for Federal and State xi agencies. Highlights include: $1.9 billion was collected for past due child support obligations submitted to TOP by the Department of Health and Human Services (HHS), and Office of Child Support Enforcement (OCSE) on behalf of States and territories. $605.3 million was collected for 48 States and the District of Columbia that participate in TOP s State Income Tax Program, whereby Federal tax refunds are offset to collect delinquent State income tax obligations. xii $37.9 million was collected for the seven states that participate in TOP s State Reciprocal Program whereby eligible Federal payments are intercepted to collect debt owed to States, and States intercept State payments to collect delinquent non-tax Federal debt. In return, these States collected $14 million for Federal agencies. $326.2 million in Federal tax refunds were intercepted to collect unemployment compensation debt owed to 39 States and the District of Columbia. TOP collected $601.6 million of unpaid Federal taxes through the Federal Payment Levy Program. 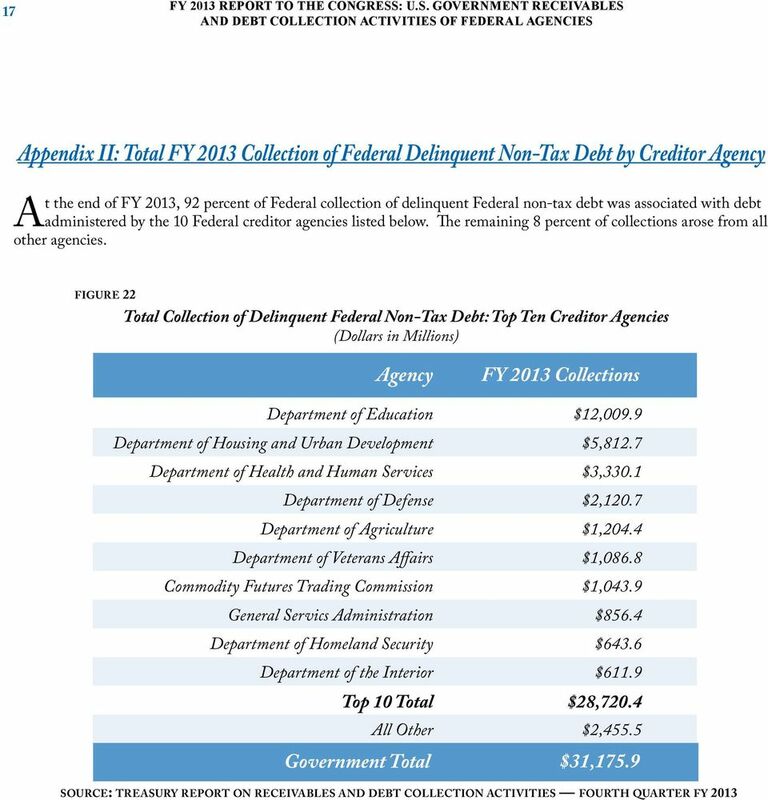 25 FY 2013 REPORT TO THE CONGRESS: U.S. GOVERNMENT RECEIVABLES 22 Endnotes i Collections on receivables include loan consolidations from the Department of Education. A loan consolidation is the process of combining one or more eligible educational loans into a single new loan. ii More information on the Education s Student Aid programs can be found in the Annual Report for Federal Student Aid ( iii All year-over-year changes are calculated based on the exact value in whole dollars and may differ from the change calculated based on the rounded values expressed in millions or billions of dollars. iv Non-loan receivables include fines, penalties, and overpayments. 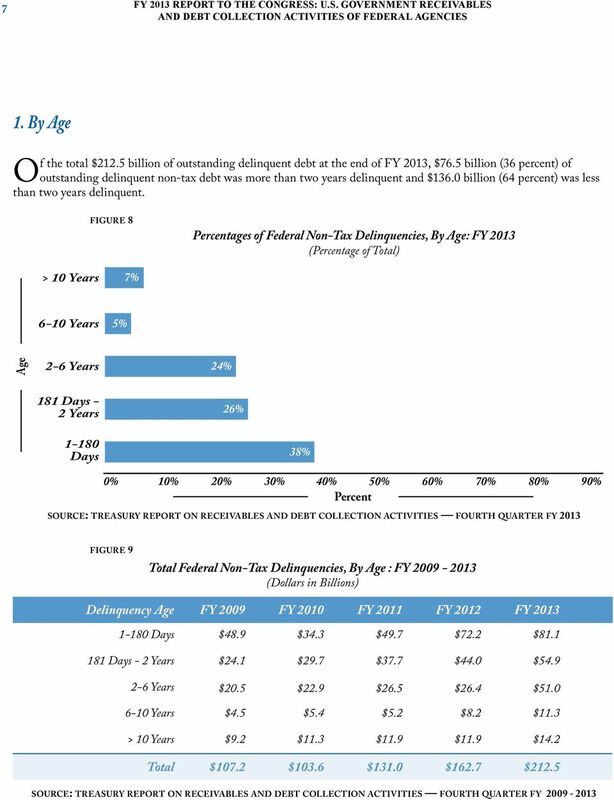 v The calculation of the amount that became delinquent during FY 2013 is based on debt that was between 1 and 365 days delinquent as of September 30, vi Generally, one-time payments (tax refunds and vendor payments) may be offset up to 100% of the payment amount. For recurring payments (Social Security, retirement, and salary), the offset amount is statutorily limited to a percentage of the payment. vii The Cross-Servicing Program collected $926,000 through DOJ by the close of FY viii An enforced collection occurs when DOJ uses a legal process to force the involuntary payment of a debt by a debtor. Examples of enforced collection processes include a court-ordered wage garnishment sent to the debtor s employer or a bank garnishment filed with the debtor s bank, effectively seizing the funds from the debtor s pay or bank account. ix Write-off of delinquent debt is an accounting action. Collection of the delinquent debt, however, may still be pursued by the Federal creditor agency. x A levy is legally distinct from offset. While offset involves the netting out of mutual obligations between two parties, a levy is a legal seizure of property, usually in the hands of a third party, to satisfy a tax debt. 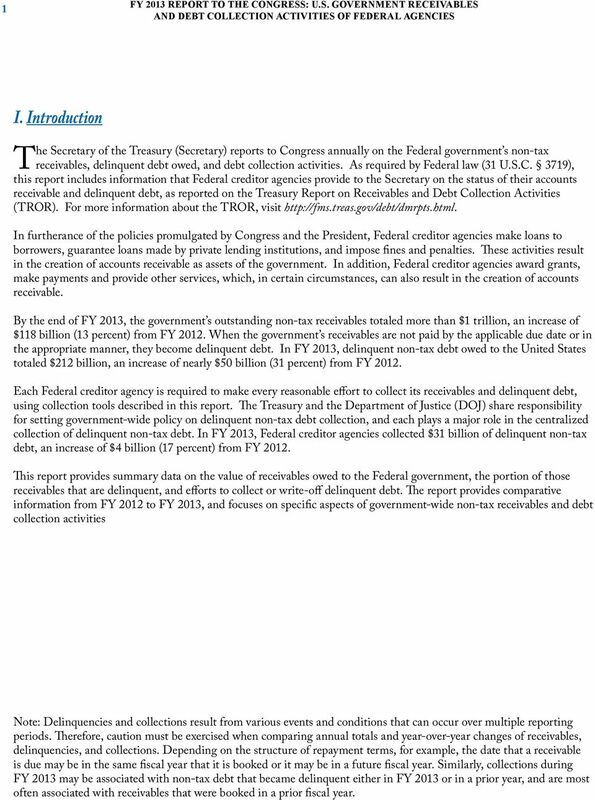 xi For more detail on Treasury s collections on behalf of states, see the Annual Report to the States ( debt/top_annual_report_to_states_fy12.pdf). xii Nine (9) States do not have an income tax. xiii Administrative Offset refers to the offset of Federal non-tax payments to collect delinquent debts. xiv SNAP, the Supplemental Nutrition Assistance Program, is a government assistance program to help low-income households pay for food. States submit delinquent SNAP obligations to the USDA, Food and Nutrition Service, which in turn submits the debts to TOP for collection through the offset of Federal tax refunds and other eligible payments. EVALUATION OF ACCOUNTS RECEIVABLE MANAGEMENT VAMC WASHINGTON, DC. Don t get discouraged if you are in default on your federal student loan. United States Government Accountability Office April 2011 This Report Is Temporarily Restricted Pending Official Public Release. Appendix B. Section 2.01 The minimum loan amount that a participant may request is $2,500.